On this day, in Haworth, William Weightman died. He was buried on the 10th. The Journal de Bruxelles on this day observed that for some days now they were actively demolishing the two buildings opposite the Pensionnat, on either side of the Belliard Steps. 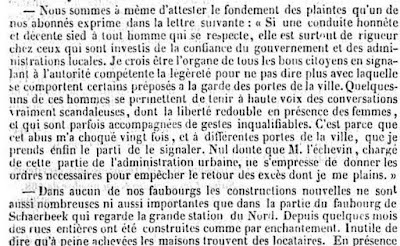 The aim was to restore the old panoramic view of the city from the statue of Belliard (see this article). The kiosk in the Parc was being renovated, l’Indépendant reported, for the nearby September festivities. And on this day (it wrote on the 15th) they began placing arcades in the Parc for “la grande illumination,” a part of these festivities later on in the month. 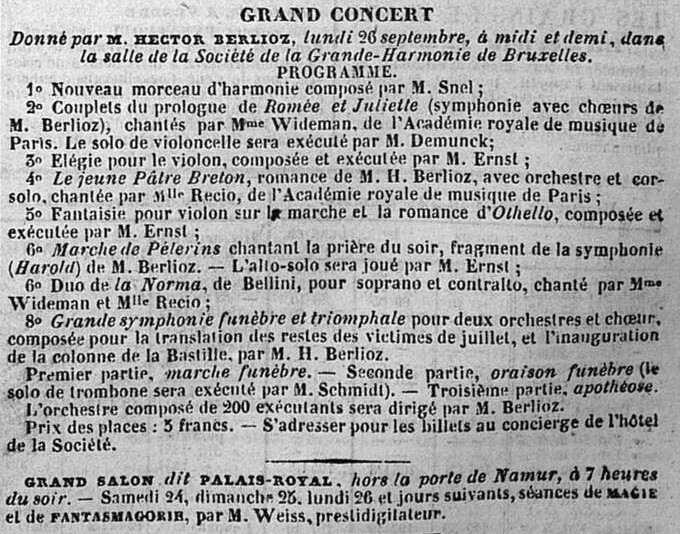 The paper also reported that on the streets in Brussels one could see “grandes affiches” announcing the concert Hector Berlioz was to give on the 26th. That is quite interesting, as one wouldn’t expect such large street posters at this time. There must then have been a good many more smaller affiches, for other cultural events. Charlotte and Emily may have gone to the Marché-aux Poissons, for the kermesse there. It attracted a lot of visitors, according to l’Indépendant. 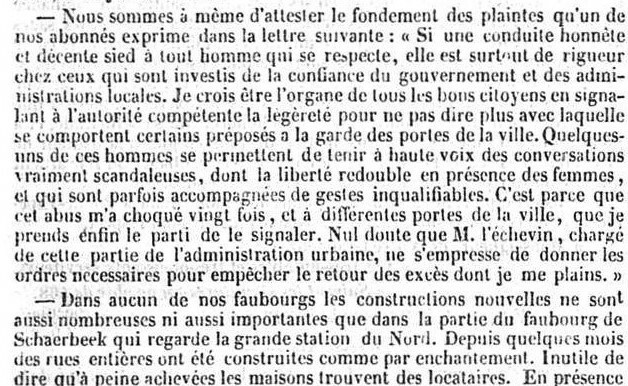 The Journal de Bruxelles had an interesting letter from someone complaining about the deplorable, “vraiment scandaleuses” behaviour of guardsmen at the City’s Portes, especially towards women. It gives an idea what it was like for the sisters to leave or enter the city by one of the Portes, for instance when going to Koekelberg, or the Jenkinses, in Ixelles. The Société Philharmonique gave its last Jardin Botanique concert of the season. This day marked the beginning of the September festivities. There were concerts in the Park, the museums and the Salon were free to visit on this day, which began loudly, with 21 cannon shots at 8 am. The sisters could in these days have gone to the Dahlia flower show, to horse-racing, a theatre play at the Vaux-Hall, or the crossbow shooting, the tir à l’arbalete. They will have known about the Pensionnat’s garden origin as the Jardin des Arbalétriers. Despite the rain a concert in the Park went ahead (choral works). It didn’t affect the number of visitors, the Journal de Bruxelles said. The day started with a new salvo of 21 cannon shots, at 8 pm. At midday there was a concert in the Park by the military harmony orchestra, attended by many people. The sisters may also have witnessed a choir procession. Starting at the Champs de Mars, near the Porte de Namur, a number of choirs walked to the Temple des Augustins for a concours (Berlioz was one of the members of the jury). They were obviously already singing along the way. At several places in the city there were ‘popular games.’ The Société de la Grande Harmonie gave a concert in the Park, in the kiosk. There were few visitors surely, because of the rain. Reporters must have gone to a café instead, as both our newspapers have no concert review. The weather did also spoil the “grande illumination” in the Parc. A banquet was offered to the men who got wounded in the uprising of September 1830, at the Champs-Elysees, which was close to where the Jenkinses were living. 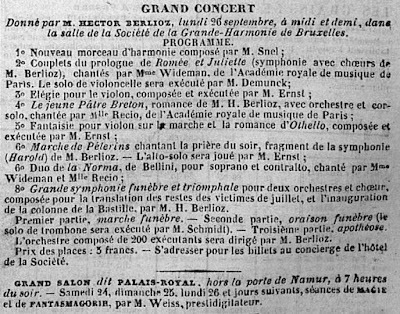 Berlioz on that evening conducted the orchestra of the Société Royale de la Grande Harmonie. 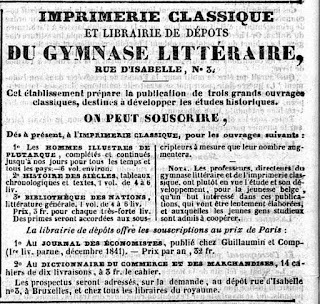 The program had been printed in l’Indépendant two days earlier. Because of the September “fêtes” there were no newspapers on this day. It was unfortunately another miserable weather day. The city celebrated the success of the choir of the Société Réunion Lyrique de Bruxelles at a national competition. Streets were adorned, the bells were ringing, the artillery fired salvos, and the winners marched in procession through the streets. 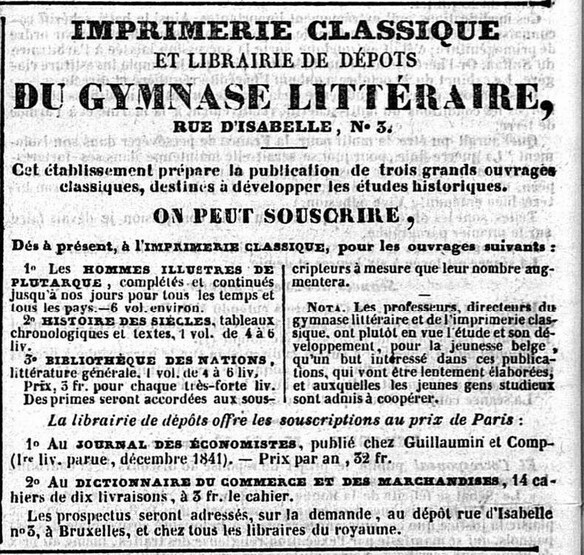 The Moniteur belge reported about education prizes, mentioning too Auguste Dement (joint first place) and Alfred Adan (honorary mention), both pupils of M. Heger at the Athenée.